Rising from the depths… Just when you thought it was safe to go back in the water! 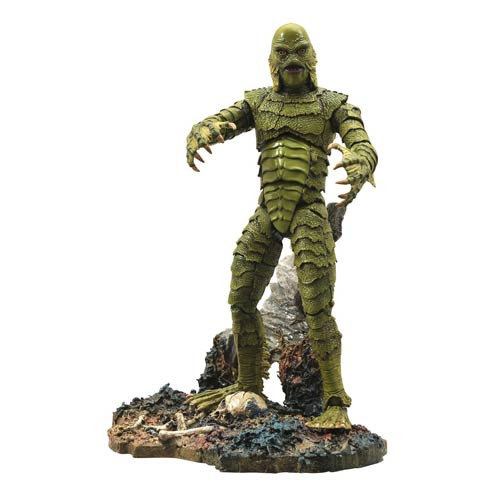 Diamond Select Toys revisits the Black Lagoon with this all-new figure depicting the world-famous Creature, first seen in 1954's Creature from the Black Lagoon. This 7-inch scale action figure features a new sculpt with over 16 points of articulation, and can strike a wide variety of poses on his deluxe display base, which features a skeleton and an undersea rock formation. The Creature and his base come packaged in Select-style display packaging, with spine artwork. Sculpted by Jean St. Jean! Ages 8 and up.